1 of 3 Season fish with pepper. Mix flour with Creole Spice in a shallow bowl and dredge fillets in seasoned flour. 2 of 3 In a large skillet, melt 4 tbsp butter over medium-high. Add fish and cook until golden brown, about 3 minutes per side. Transfer to a serving platter. 3 of 3 Add 4 tbsp butter to skillet, swirling over medium-high so that it melts evenly and takes on a brownish hue, 3 minutes. Reduce heat to medium-low, add almonds and cook, stirring gently, until toasty brown, about 2 minutes. Add lemon juice, parsley and salt. 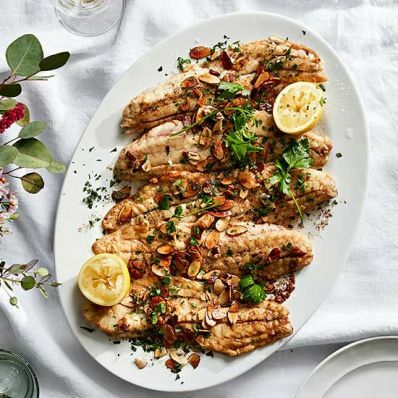 To serve, spoon browned butter and almonds over fish. 1 of 1 Combine 2 tbsp celery salt, 1 tbsp sweet paprika, 1 tbsp coarse sea salt, 1 tbsp black pepper, 1 tbsp garlic powder, 1 tbsp onion powder, 2 tsp cayenne pepper and 1/2 tsp ground allspice. Mix well.